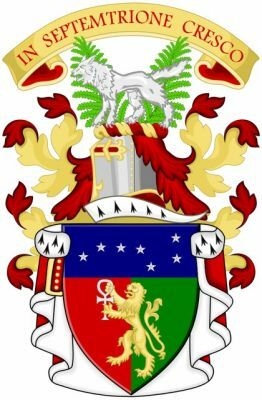 Arms: Parted per pale Gules and Vert, a lion rampant Or holding a cross ansated Argent, on a chief Azure a representation of the Great Bear constellation of the Fourth. Above the Shield, behind which is draped his feudo-baronial mantle Gules doubled of silk Argent, fur-edged of miniver and collar Ermine and fastened on the right shoulder by five spherical buttons Or, is placed a chapeau Gules furred Ermine (in respect of his feudal Barony of Rachane), thereon an Helm befitting his degree with a Mantling Gules doubled Or. Crest: On a Wreath of the Liveries is set for Crest a wolf statant Argent between two sprigs of fern Proper. Badge: As Baron of Rachane, a sprig of fern Proper charged with a representation of the Little Bear constellation Argent. Standard: The Badge is depicted in the first and third compartments and the said Crest in the centre compartment upon a Standard three and a half metres in length of four tracts Or and Gules, split at the end, having Azure the cross of St. Andrew in the hoist, with the Motto “IN SEPTEMTRIONE CRESCO” in letters Argent upon two transverse bands Azure. Granted: Court of the Lord Lyon, 18th May 2006.